Do You Love The PS4 Enough To Eat It? No, stop eating your PS4. I said stop it. Stop! 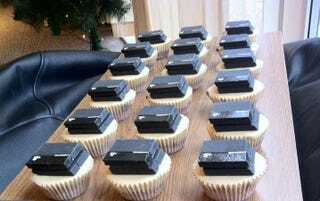 Instead, have a look at these lovely PS4 cupcakes. They're the creation of Stephen Rushbrook of UK developer Stainless Games, where it is office tradition to bring in treats on one's birthday. Back when the PS4 was announced, there was lots of speculation surrounding its release date, one candidate being December 13—Stephen's birthday. A colleague joked that should he get a PS4 for his birthday, he should bring enough for everyone in the office. And so he did! Happy birthday, Stephen! I'll just be sitting here, staring at these photos, hungry.